In the 1960s and 1970s while American automakers were fixated on two-door muscle cars, European automakers like BMW and Mercedes were producing sporty four-door sedans that could accelerate quickly and handle like sports cars. Upon its release, the four-door 1968 BMW Bavaria was the first true sports sedan with handling and performance that trumped all other four-door sedans of that period. BMW and Mercedes spent the 1970s honing their craft of making sporty sedans, while the American automakers remained asleep except in a few rare cases. BMW and Mercedes were slowly increasing their American sales steadily in the 1970s however it was mostly “well heeled” individuals who were buying these cars, these buyers were the early wave of Yuppies. Pontiac noticed the new trend first among American automakers and released a brand new sporty four-door sedan for 1973 called the Grand Am. The Grand Am provided excellent handling and had plenty of power along with a sleek attractive exterior. Only problem was the public did not bite, they were not ready yet for what the four-door Grand Am had to offer. Pontiac fortunately also offered a two-door version of the Grand Am which was a smart decision since sport coupes were hot sellers in the 1970s. Ford surprising gave the segment a try (after Pontiac introduced the four-door Grand Am) by offering a Granada with European flair called the Granada ESS. The ESS was available as a coupe or four-door and was Ford’s attempt to compete with Mercedes. Ford even went so far in its 1978 advertisement literature to challenge buyers if they could tell the difference between a four-door Granada ESS and a $20,000 4-door Mercedes-Benz. Unfortunately for Ford most buyers could. Though the Granada ESS was a noble effort, it was no European sports sedan. Pontiac again decided to release a European sports sedan for 1983. This time Pontiac used GM’s new downsized front-wheel drive A-body platform – the car was called the Pontiac 6000 STE which was a smash success. Though it was front-wheel drive it handled like a sports car. Power was provided by a 135 horsepower 2.8 liter H.O. V6. In essence it was the most well-rounded European style touring sedan to come from America up to that time. The 6000 STE even made Car and Driver magazine’s prestigious “Ten Best” list from 1983 to 1985. Ford had been caught napping, it fought back in 1984 with the four-door rear-wheel drive LTD LX which came equipped with a 165 horsepower 5.0 liter H.O. CFI (Central Fuel Injected) V8 and incorporated some performance suspension tweaks not available on the standard LTD. Though the LTD LX was an impressive offering, it was closer to a traditional muscle car than a European sports sedan; in essence it was a four-door Mustang GT. When Ford replaced the LTD in 1986 with the front-wheel drive Taurus, a new era for Ford had begun. The Taurus was an immediate sales success however something was missing with the new Taurus. Performance sedan buyers soon figured out the Taurus was not on par with the leaders of the sporty four-door sedan segment. The Taurus’ handling fell short along with its performance. Ford fortunately was listening and for 1989 it released the Taurus SHO (Super High Output). The Taurus SHO had a DOHC 24 valve 3.0 liter V6 that produced an impressive 220 horsepower along with having great handling and braking to match the power output. Adding to the SHO’s performance persona was a mandatory 5-speed manual transmission. The SHO was the ultimate performance sedan when it was released, and it remained at the top of its competition until its cancellation after the 1999 model year. Ford then spent ten years wandering in the wilderness until this year when the new 2010 Taurus SHO arrived on the scene. The 2010 SHO is a clean slate for Ford; it is not a continuation of the former SHO but a new rendition of it. In other words if you liked the former SHO you may hate the new one, or if you hated the old SHO you may like the new one. The old SHO’s main purpose was to be a no frills performance sedan. Though it did have some luxury and convenience options the SHO never sacrificed performance for luxury or comfort. Even the last generation of SHO (1995–1999) was a little bit more civilized than previous SHOs but its main focus was still on performance. For the 2010 SHO it is about performance, luxury, and comfort – all the bases are covered with this car. The new SHO is a big car with a length of 202.9 inches, width of 76.2 inches, height of 60.7 inches, wheelbase of 112.9 inches, and a weight of 4,368 lbs. It’s easy to see that the Taurus platform which the SHO resides has moved up to large car status. Ford fans who have been weeping the loss of the big Crown Victoria need not weep; the new Taurus is “big car” enough to fill the gap. To understand how big the new SHO has become let’s compare it to the original 1989 SHO which had a length of 188.4 inches, width of 70.8 inches, height of 54.1 inches, and wheelbase of 106 inches. But the real eye-opener is the weight; the 1989 SHO weighed in at 3,285 lbs which is slightly over one thousand pounds lighter than the new SHO. So it’s easy to see how comparing the 1989 SHO to the 2010 version is like comparing an orange to a cantaloupe. With the SHO being such a large car does this mean the fun to be expected from a car with the SHO name is gone? Fortunately the answer to this is a big “NO”. The new SHO is the best yet, it’s a true performance sedan that’s not only worthy of its legendary name but actually surpasses what is expected of a SHO. To accept the SHO as only a performance car would not be fair; for it is far more than that. The SHO also provides the ultimate luxury comfort and full functionality that the original SHO never provided. In fact it provides more in these areas than many more expensive full-size sedans. For instance a full-size BMW 745 sedan has a decent sized 14 cubic feet of trunk space; the SHO in comparison has a whopping 20 cubic feet of trunk space – would not take a family long to figure out which of these two cars they would drive to the beach with a whole lot of luggage. The SHO’s beautiful interior is roomy and so very comfortable. Even if you are as big as GEICO’s Ed “Too Tall” Jones, you will feel comfortable in the SHO. Most luxury sedans have the cockpit room of a F16, where the driver looks and feels like he or she was shoehorned into a driver’s seat which has no wiggle room to speak of. With the SHO’s expanse of open space the driver feels as comfortable as sitting in a big roomy Sharper Image massage chair; of course the SHO’s optional front seat massagers help in this regard. It’s the perfect car for long trips. The type of car you would look forward to driving on a 3,000 mile trip from Washington, D.C. to Los Angeles. Also the luxury amenities are many on the SHO, and come to think of it the SHO in many respects trumps its Lincoln brothers in this regard. One of its best features is the optional navigation system which does more than get you from point A to point B but does such tasks as finding the least expensive gas or locating your favorite type food. And it can do these types of things not just with a touch of a button but by merely speaking a few words – the voice recognition understands your voice commands. Think of this system being the SHO’s version of K.I.T.T. from the TV show Knight Rider without the sarcastic comments that the Hoff had to endure for four TV seasons. Driving the SHO is a real blast. Even barely touching the accelerator pedal the SHO effortlessly moves around like a ballroom dancer. The driver’s gauges are well placed and visibility out all the windows is very good. The steering wheel feels just right and the automatic shifter is well placed in the center console. You can boulevard cruise in this car all day long, especially with your favorite tunes playing on the SHO’s fine sounding optional 12-speaker sound system. The exhaust system is slightly muted for a performance car, but still has a pleasant sound. The SHO shows its true colors when the accelerator is slammed to the floor; the 365 horsepower 350 lb-ft of torque small twin turbo EcoBoost 3.5 liter V6 comes alive with a massive rush of power. When this happens the fun factor goes sky high, the turbo 3.5 liter V6 feels more like Ford’s legendary Super Cobra Jet 428 CID V8 than the V6 that it is. And the heavy SHO (with the optional performance package’s 3.17:1 axle ratio) sprints 0-60 mph in 5.2 seconds and does the 1/4 mile in 13.7 seconds at 102 mph. These figures show that the SHO runs slightly faster than the lighter legendary 428 Cobra Jet powered Mustangs from yesteryear. 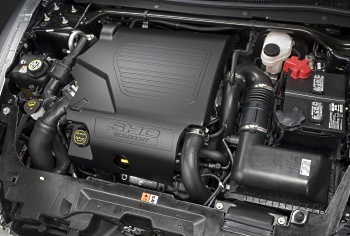 The turbo EcoBoost 3.5 V6 has absolutely no turbo lag; it’s a true technological wonder. It provides the power of a high-performance V8 with V6 fuel efficiency. It provides an EPA city rating of 17 mpg and a highway rating of 25 mpg which for an all-wheel drive 365 horsepower road rocket is impressive. However that’s not to say there aren’t high performance V8s in this mpg territory – a similarly sized (four-door) all-wheel drive 2010 Dodge Charger with the 368 horsepower 5.7 liter Hemi V8 has an EPA city rating of 16 mpg and a highway rating of 25 mpg. The 5.7 Hemi Charger’s good mpg numbers can be attributed to its state-of-the-art Multi-Displacement System (MDS) cylinder deactivation system (without this system the Hemi V8 would have a much lower mpg rating). The downside is the SHO is only available with a 6-speed automatic transmission. The SHO is the perfect candidate for a 6-speed manual transmission hopefully Ford will offer one in the near future. The upside is a paddle-shifter is standard with the automatic which makes the lack of manual transmission palatable. The 6-speed automatic is a smooth shifting transmission and it always seems to find the right gear in most driving conditions. There’s a reason why most expensive performance cars and sedans are rear-wheel drive. It’s hard to beat the superior handling characteristics of rear-wheel drive. The new Taurus platform is front-wheel drive which puts the Taurus at a handling disadvantage in comparison to its rear-wheel drive competitors. Ford’s workaround for this disadvantage is the implementation of an all-wheel drive system for the SHO. The system provides excellent handling and does a good job of getting the power to the pavement with the least amount of wheel spin. As good as the SHO package is, there is an optional “performance package” which for $995 is a downright bargain and “a must have” for any driver who demands the ultimate in performance. With the performance package the SHO’s standard 19 inch wheels are upgraded to 20 inch wheels (with P245 45VR20 Goodyear Eagle F1 performance tires). Also added with this package are high-performance brake pads, upgraded performance oriented steering, a “Sport Mode” setting that allows the driver to shutoff the AdvanceTrac Electronic Stability Control system (for some tire burning fun), and a more performance-oriented axle ratio of 3.17:1 (verses the standard 2.77:1). With this package the spare tire is deleted to save on weight. This package helps the SHO hit .87 g on the skidpad which puts most performance sedans to shame. And this great handling does not come at a sacrifice of a comfortable ride. The SHO handles the rough pavement and potholes as well as the turns. In other words this car can be driven through the worst urban decayed roads and still give passengers the feeling of riding on a silky smooth surface. The upgraded brakes in the performance package enable the SHO to stop in an ultra short distance of only 112 feet from 60-0 mph. The 2010 SHO is an attractive car that has an overall elegant muscular look which is much more appealing than all the previous SHOs which were made during Ford’s “futuristic aero” design period (where everything Ford made seemed to be shaped like an egg). Fortunately Ford has outgrown this design phase and recently is producing some of its best looking cars in decades – the new Mustang is an example of this new design direction. The good news about the new SHO is the base price of $37,995, the bad news is loaded with the all the options it hits the $46K range. Even at this price the SHO is a good deal. Not only is the 2010 SHO the largest and best performing Taurus ever, it’s also the most well-rounded. The Taurus SHO has finally grown up and become the performance car it always wanted to be. With cars like this now coming from Dearborn, the future looks mighty bright for Ford.